Under the new direction of Creative Director Damiano Biella, high-end luxury brand Escada recently launched the signature Margaretha handbag. 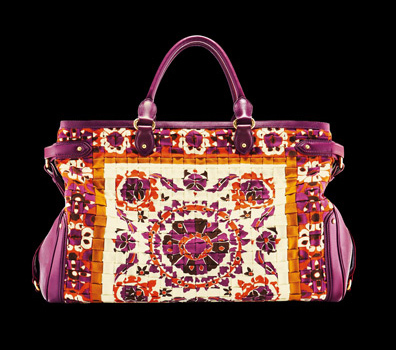 The bag, which pays homage to founder Margaretha Ley, is made of pleated woven leather and comes in a variety of colors including fuschia, tangerine and black, along with two mosaic printed leathers. The double top handle bag is a luxe addition to any Spring/Summer handbag wardrobe collection and the printed leather tote is a brilliant work of art.